I love the early summer liturgical "trifecta" of Pentecost, Trinity, and Corpus Christi, forming a kind of "encore" to the joyful Easter Season focusing in succession on three fundamental realities of the Christian life: the Church, the Triune Godhead, and the Eucharist. This "trifecta" comes to an end this week with the celebration of the Body and Blood of Christ. Upon reading this, supported with other teachings of the Fathers on the Eucharist, I came to believe in the Real Presence. But then the following chain of thoughts occurred to me: (1) Let us acknowledge that Eucharist is truly transformed into the Body of Christ. (2) But does this happen when any Christian, at any time, prays over bread? Does every Christian have the power and authority to make bread into the true Body of the Lord? Surely that would be ridiculous, and lead to abuses of all kinds: persons confecting the Eucharist in sacrilegious ways, and treating the Eucharistic Lord without proper reverence. (3) Therefore, it must be the case that only certain persons, at certain times, can transform bread into the Body of Christ. (4) Who would those persons be, and what would those times be? Surely they must be persons authorized by the Church to do so, at the times when the Church authorizes the Eucharist to be celebrated. (5) But to be entrusted by the Church with the authority to celebrate the Eucharist is an awesome responsibility that marks a person out from among the laity of the Church. (6) Therefore, the Real Presence of Christ in the Eucharist inevitably requires that there be a class of persons marked out from among the ranks of believers who are set aside and entrusted with the authority to celebrate the Eucharist at the proper times. This class of persons would constitute a priesthood. This line of reasoning could surely be stated better and more succinctly by others, but I hope I have made it somewhat clear why a Real Presence doctrine of the Eucharist, in which the bread and wine are truly transformed into the Body and Blood of Christ, requires a new covenant priesthood. On the other hand, if the Eucharist is merely symbolic, it does not require priests to celebrate it. And indeed: Protestantism has a non-sacramental, non-priestly, purely functional view of their clergy. Melchizedek's name is Hebrew for "King of Righteousness." He is identified as "king of Salem." "Salem" is a form of the Semitic root for "peace," as in the Hebrew "Shalom." "Salem" is also the archaic name for Jerusalem, employed in at least one Egyptian inscription (I believe it is a campaign itinerary of Ramses II, if memory serves) as a reference to the city. Jewish tradition held that Melchizedek was none other than Shem, son of Noah, based on the fact that Shem lived into the lifespan of Abraham, and who else would be qualified to invoke a blessing upon Abraham. "Melchizedek" was then understood as a throne name (which it surely was, whatever one may think of the identification with Shem). Thus, in the ancient Jewish view, Melchizedek transmitted to Abraham the blessing of the patriarchs extending through Noah all the way back to Adam. Some hold that the bread and wine brought out were merely for the refreshment of Abraham and his men. The text, however, connects the bread and wine to Melchizedek's priesthood and the conferral of the blessing, so it would be better to understand the bread and wine as liturgical offerings (i.e. a grain offering with a libation). This does not exclude a practical use for the refreshment of those present, because liturgical offerings in the ancient world were often consumed by the worshipers as part of the ritual. It seems that the kingship of the city of Jerusalem carried with it a priestly role, going back at least to the figure of Melchizedek. Later, in 2 Samuel 5, when David becomes King of Jerusalem, he seems to take on the priestly role that comes with his office, a kind of "Melchizedekian Succession." In 2 Samuel 6, for example, we see David functioning as a priest when the ark is brought up into Jerusalem (vv. 12-19). (The liturgical feast that David provides on that occasion (2 Sam 6:17-19) is itself a type of the Eucharist.) David's priestly role was transmitted to his sons, according to 2 Sam 8:18. Jesus is the ultimate Son of David, whose priesthood can be traced back to Melchizedek (and then, if Melchizedek is Shem, back to Adam). Thus, Jesus' priesthood is more ancient and venerable than the priesthood of the Levites, which was only conferred on them after the sin of the Golden Calf (Exod 32:25-29). 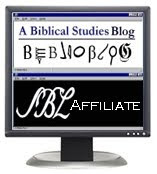 This is one of the arguments of the Book of Hebrews. To sum up, Gen 14:18-20 reminds us that in Jesus we still have a priest who exercises the priesthood of Melchizedek, a priesthood that involves the offering of bread and wine which confers on the recipients blessing and salvation from their enemies. Psalm 110, like Psalm 2, was probably an ancient coronation hymn sung when each new successor of David mounted the throne to begin his reign. Psalm 110 reminds the new Davidic king of his noble priestly role, a role (as we saw above) that goes back to the great Melchizedek himself. The words of this hymn are hyperbolic when applied to any of the merely natural sons of David, but the words reach their full potential and meaning when applied to Jesus Christ. He is the one truly "begotten" by God, like the "dew," which forms before the start of the "day," (that is, before the dawn of creation). He is a priest "forever" in the fullest sense, for he never dies. Nonetheless, the Father has not yet made all his enemies "at footstool for his feet," and he "rules in the midst of his foes," that is, He leads us (the Church) to victory even though we are surrounded by enemies and persecutions in this life. In the New Testament the sequence of verbs "take," "give thanks" (or "bless"), "break," and "give" are almost a technical sequence denoting the celebration of the Eucharist or its types. In this recitation of the Eucharistic "Institution Narrative" by St. Paul (which most closely resembles Luke of all the Gospels), we see the first three in this verbal sequence: "take," "give thanks" (Gk eucharisteo), and "break." We note here the role of tradition. This passage, in fact, is witness to the process of sacred Tradition: authoritative teaching handed down from Christ through the Apostles. St. Paul speaks of "receiving" (Gk paralambano) teaching from the Lord and then "handing it on" (Gk paradidomi). The verb for "hand on" (paradidomi) corresponds to the Greek noun for "tradition" (paradosis). The Eucharist is the great tradition par excellence of the Church. The Eucharist is the "new covenant." As Dr. Scott Hahn is fond of pointing out, the "new covenant" (or "new testament") is not first of all a collection of 27 sacred books. It is, first of all, a liturgical act, a ritual celebration of bread and wine transformed into the Body and Blood of Jesus. The twenty-seven books of the "New Testament" only come to take on that name because of their association with the celebration of the Eucharist. They are the books read at each renewal of the new covenant. It is so striking that Jesus identifies his Eucharistic Body and Blood as the new covenant itself. This fulfills the prophecies of Isaiah 42:6 and 49:8, that the "servant of the LORD" would actually become a covenant. We recall that a covenant, in the ancient world, was essentially a conferral of kinship via an oath. The Eucharist confers divine kinship in the most direct way possible, by placing within us the very body and blood of God. Here we see the sequence of Greek verbs by which the New Testament typically denotes the Eucharist or its types: "take", "bless" (functioninal equivalent of "give thanks"), "break," "give." Although the Church gives the most liturgical attention to the account of the Feeding of the 5000 in John 6, this miracle narrative functions as a Eucharistic anticipation in all four of the Gospels. We learn about the Eucharist by reflection on this miracle. The Eucharist is our supernatural food. It is not the product of the personal efforts of the clergy: the disciples admit they don't have the resources to feed the people. The Eucharist comes to us as we live in distress in the midst of the world. This world is truly a spiritually "deserted place," a place without any lasting satisfaction, a place without the resources to satisfy our deepest hunger, which is for God Himself. But the Eucharist is the food we may eat and truly "be satisfied." Twelve baskets full are picked up afterwards, which (1) foreshadows the care for every particle of the Eucharist that later will be manifest by the Church, and (2) denotes by the number twelve the fullness of the tribes of Israel. Those who partake of the Eucharist are constituted as the New Israel, the new Twelve Tribes ruled over by the Son of David who is a "priest forever after the order of Melchizedek." As long as any one has the means of doing good to his neighbours, and does not do so, he shall be reckoned a stranger to the love of the Lord. Those who have become acquainted with the secondary (i.e., under Christ) constitutions of the apostles, are aware that the Lord instituted a new oblation in the new covenant, according to [the declaration of] Malachi the prophet. For, "from the rising of the sun even to the setting my name has been glorified among the Gentiles, and in every place incense is offered to my name, and a pure sacrifice;" as John also declares in the Apocalypse: "The incense is the prayers of the saints." Then again, Paul exhorts us "to present our bodies a living sacrifice, holy, acceptable unto God, which is your reasonable service." And again, "Let us offer the sacrifice of praise, that is, the fruit of the lips." Now those oblations are not according to the law, the handwriting of which the Lord took away from the midst by cancelling it; but they are according to the Spirit, for we must worship God "in spirit and in truth." 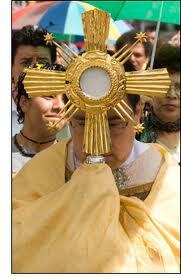 And therefore the oblation of the Eucharist is not a carnal one, but a spiritual; and in this respect it is pure. For we make an oblation to God of the bread and the cup of blessing, giving Him thanks in that He has commanded the earth to bring forth these fruits for our nourishment. And then, when we have perfected the oblation, we invoke the Holy Spirit, that He may exhibit this sacrifice, both the bread the body of Christ, and the cup the blood of Christ, in order that the receivers of these antitypes may obtain remission of sins and life eternal. Those persons, then, who perform these oblations in remembrance of the Lord, do not fall in with Jewish views, but, performing the service after a spiritual manner, they shall be called sons of wisdom. Speaking always well of the worthy, but never ill of the unworthy, we also shall attain to the glory and kingdom of God. It's because of Saints Iraneus and Augustine that I speculate that Jesus is symbolized by both the father and the prodigal son, because He is God (father) and Man (prodigal son) and because His Humanity is joined to God the Son in Hypostatic Union and is anointed by God the Holy Spirit in Baptism, so that, as it were, His Humanity is embraced by the Arms of God (the Son and the Spirit of God).